Omaha, NE (April 4, 2019) – Steve Schaefer rode Zarkava to victory over a 23-horse field in the $7,500 Open 1.40m "Wild Card" Welcome Stake at the 2019 Burlington Capital International Omaha. Schaefer rode his mare to one of six clean rounds over the 13-jump one-round course designed by Bernardo Costa Cabral of Portugal. With three "Wild Card" entries available for Friday evening's $100,000 InIt2Winit Speed Jumping Series Championship, his win in a blazing 55.758 seconds earned him a place in Friday's line-up. "I knew I had to be in the top three if I was going to qualify for the Final," Schaefer said. "My mare is really fast; I'm so lucky to have her. She was great and I am so excited about getting to go tomorrow night. Hopefully things will go just as well." Also earning places in Friday evening's Final were Femke Courchaine who placed second in a time of 58.293 seconds on Dereusa S and Lisa Goldman-Smolen who finished third in 60.214 seconds on Nike. Other action on Thursday saw wins by Caelinn Leahy on Dominicus over a 48-horse field in the $1,000 Open 1.10m class, Doug Boyd on Calvigo over a 45-horse field in the $1,500 Open 1.20m class, and Kristin Hardin on Eminent over a 26-horse field in the $3,000 Open 1.30m class. 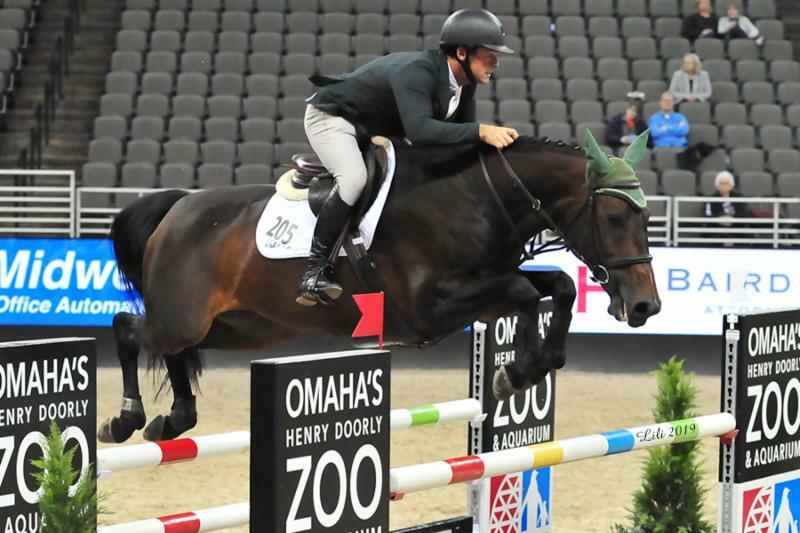 The 2019 Burlington Capital International Omaha, the ‘Midwest’s Largest Horse Event,’ runs April 4-7 at the CHI Health Center arena in Omaha, Nebraska, home of the highly successful 2017 FEI World Cup™ Finals. Now in its seventh year, the Burlington Capital International Omaha hosts everything under one roof – stabling, warm-up, competition arena, educational and exhibit area, demonstrations, dining venues and shopping for both the horse aficionado or anyone just looking for a unique gift. Competition highlights include the $100,000 International Omaha Grand Prix,$100,000 InIt2Winit Speed Jumping Series Championship and $50,000 Dressage Team Challenge in which six teams compete in a Grand Prix and Freestyle. New for 2019, the event schedule has been expanded to include Open Jumper classes and lower level dressage classes so riders can earn qualifying scores for Regional competitions. Show Jumping Hall of Famer and famed equestrian coach, George Morris, is returning again this year to headline the Educational Showcase on Friday, April 5 at 4:45 p.m. He will be joined by internationally known dressage rider and trainer, Katherine Bateson-Chandler, who was a member of the U.S. Dressage Team at the 2010 FEI World Equestrian Games™ and trains with Olympic Gold and Silver medalist Carl Hester of Great Britain. Both showcase experts will also give free demo/mini clinics in the “Triple Crown Horse Discovery Zone” during the four-day event. Further information is available at www.internationalomaha.com.